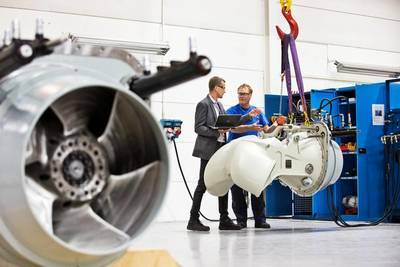 Rolls-Royce has successfully completed seatrials of its first S4 series of waterjets, designed to give higher efficiency at lower speeds. The trials aboard the recently upgraded Tangalooma Jet, a 350 passenger-carrying high-speed catamaran, indicated a 3% increase in thrust when compared to the previously installed waterjets. The ferry takes passengers to and from the Tangalooma Wild Dolphin Resort on Moreton Island, about 75 miles off the coast of Brisbane, Australia. The S4 next generation waterjet was introduced to the market at the SMM maritime exhibition in September this year, and is developed specifically to meet the reduced speed requirements of many high-speed ferry operators. Previously, high-speed ferries were designed for service speeds of 45 knots or more but due to increasing fuel costs operators are opting for waterjets optimised for lower speed and fuel consumption whilst improving vessel performance. Daniel Wikström, Rolls-Royce Product Sales Manager, Kamewa Waterjets, said: “Two 63S4 units were installed on a ferry in service previously equipped with our Kamewa 63SII waterjets. The ferry upgrade involved a complete repowering of the drive train, including engines, and the waterjets performed exactly as we predicted. Rolls-Royce has two 56S4 units on order for installation on the luxury yacht Mangusta 94 and four 71S4 units for the larger Mangusta 165. These units will be commissioned next year in time for the summer season.